A lot of people consider San Francisco as one of the most beautiful city in the world. To the question: “where would you like to live?” many Americans answer: “In San Francisco”. The Golden Gate Bridge, one of the world's most beautiful bridges and symbol of San Francisco, is one of the many attractions of this city. San Francisco, nicknamed as well “the city by the Bay” or “Everyone’s favourite city” is divided in different neighbourhoods: Chinatown, Northbeach (Little Italy), Mission (Mexican neighbourhood), Castro (Gay District), Downtown, Financial District, Nob Hill, Pacific Height, South of Market and the Sunset district. The goal of this website is to help you plan your trip to San Francisco. 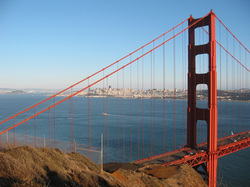 It features the best hotels, restaurants, museums, shopping, bars and more in San Francisco.